The rain is falling steadily. The leaves are dropping, covering the lawn in a blanket of browns and yellows. The grocery stores are full of turkeys, cranberry sauce, and other fixings. Yes, it must be nearing Thanksgiving. Which means one thing. Messing with mom’s table setting. 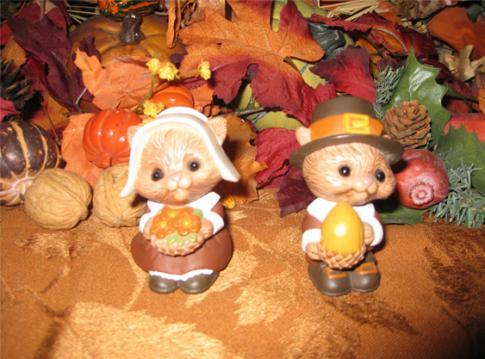 See those innocent looking pilgrim squirrels? Come Thursday, they will find themselves the victims of the sick collective sense of humor of my siblings and myself. My mom sets a mean table, and I’m not talking about the food, which is always delicious. During the holiday, the good china comes out and the dining room table is transformed into a scene out of Better Homes and Gardens. For Thanksgiving, we have nuts, leaves, a wooden turkey my sister made, and the salt and pepper shaker squirrels. My mom loves preparing her holiday table. So why would we take such a beautiful, innocent scene and turn it into something tawdry? Because we are twisted individuals. And because it’s really fun to mess with mom. We started out innocently enough. We used to just move the nuts around on the tables or put them in the wine glasses. Then one year, we decided to include the squirrels in our perverse fun. We stuck each one in a wine glass and waited for mom to see them. The squirrels don’t ever actually hold salt and pepper, which means they don’t have to stay upright. And believe me, that’s an advantage for us. My mom has found them upside down in the leaves, upside down in wine glasses, “passed out” next to empty wine bottles, and hiding in the leaves. Each time, she yells at us, going through our names, and sometimes the dog’s names, until we’ve each been blamed. Sometimes she swears at us, and will throw in a little Italian or Portuguese just for variety. We laugh, my dad stifles a laugh, and my mom returns the table to its original setting. By the time we get to the meal, the squirrels have been placed multiple times in “compromising” positions. Hey, who are we to deny the squirrels the opportunity to mate in such a beautiful setting? Of course, the mating positions are the ones that get mom to yell the loudest, so we just keep at it all day. Those squirrels sure do have some stamina! Yes, Thanksgiving is a day of food and fun. And we plan for Christmas. After all, we have a nativity scene to mess with next month.